Everify - Incredible Pizza Company - Enjoy our huge all-you-can-eat buffet, indoor Go-Kart Races, Bumper Cars, Route 66 Mini Golf, a huge video game arcade with prizes, Bowling, and more! (DHS), with information from each new employee’s Form I-9 to confirm work authorization. IMPORTANT: If the Government cannot confirm that you are authorized to work, this employer is required to provide you written instructions and an opportunity to contact SSA and/or DHS before taking adverse action against you, including terminating your employment. 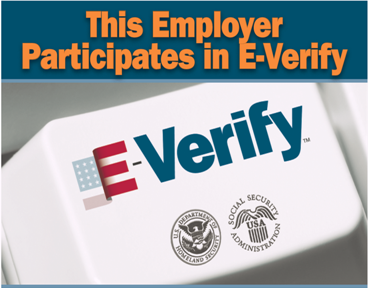 Employers may not use E-Verify to pre-screen job applicants or to re-verify current employees and may not limit or influence the choice of documents presented for use on the Form I-9. In order to determine whether Form I-9 documentation is valid, this employer uses E-Verify’s photo screening tool to match the photograph appearing on some permanent resident and employment authorization cards with the official U.S. Citizenship and Immigration Services’ (USCIS) photograph. If you believe that your employer has violated its responsibilities under this program or has discriminated against you during the verification process based upon your national origin or citizenship status, please call the Office of Special Counsel at 1-800-255-7688 (TDD: 1-800-237-2515). propósito de confirmar la autorización de trabajo.